From the 25th to the 29th of July 2016, the 7th General Electric’s Holiday Activity Week for children took place. 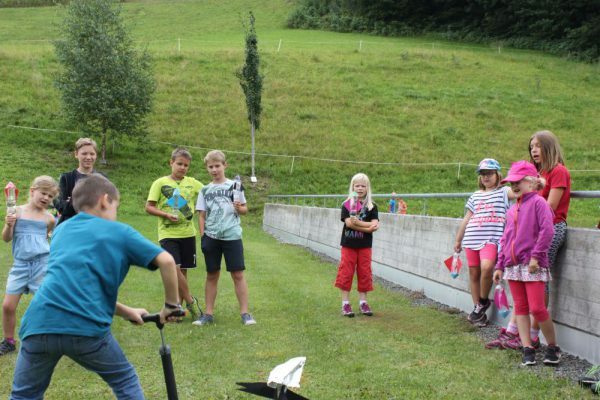 This year, the motto was “Young Stars”, and thus, the Austrian Space Forum also was a part of it and got to spend an exciting week with the children. 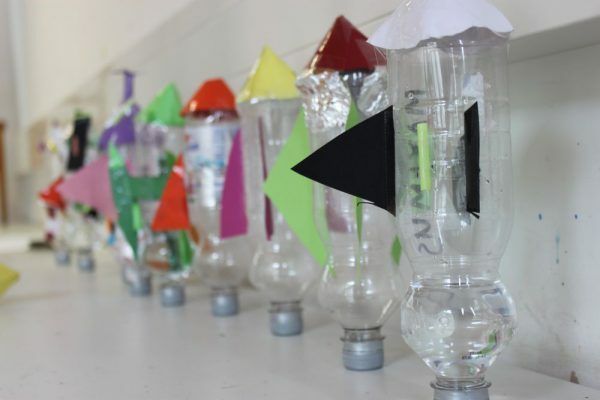 Sophie Gruber led a rocket building workshop, where the kids built rockets out of plastic bottles. 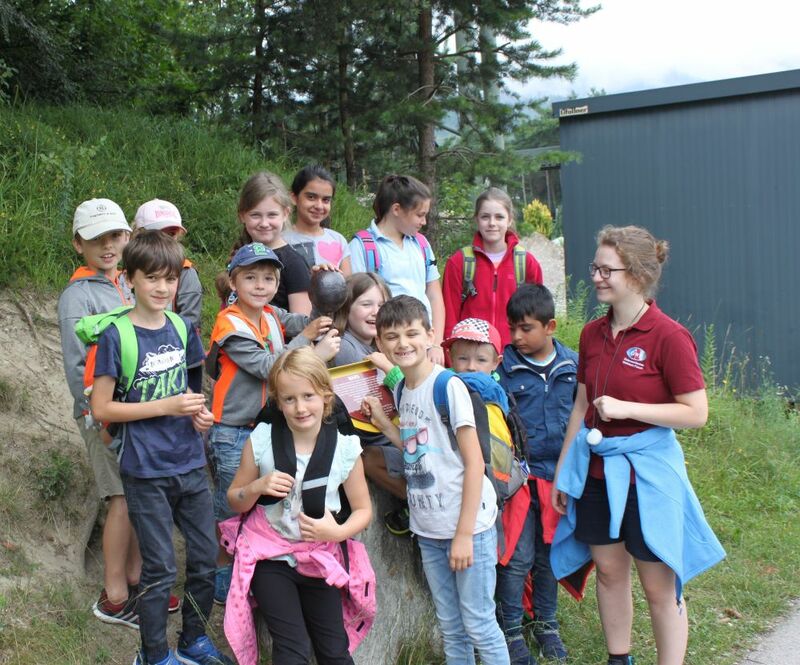 I, Laura Kronenberg, had the pleasure of taking the kids on the Planet Trail in Vomperbach, to show them our solar system. Sophie started each day with a short introduction to rockets, before the bottles, coloured paper, tape (a lot) and other crafting stuff were put to good use. First, the rocket head was cut out, then the wings were designed and the straws for the launch were cut appropriately. Everything was taped to the bottle and it was time to find a good name for the rocket: “Thunder and Lightning”, “Rosali 1” and “Polo 11” are just three of them. Then, shortly before lunch break, the moment everyone had eagerly awaited was there: the launch of the rockets. With the help of a bicycle pump, the rockets were shot to the sky, a truly exciting moment for all those involved. Sophie’s highlight of the week were the many questions the kids had for her, as well as the creativity when it came to building the rockets, for example the attachment of extra parachutes on Friday. I on the other hand took one group per day on a thrilling trip through our solar system. On the Planet Trail, the planets are shown as sculptures. We stopped at each one and I told the kids about it. My favourite part were the questions as well: What happens if you end up in a storm on Jupiter? What do astronauts do when they are in space for a long time? What if you get sucked into a black hole? I also had smell samples for some planets with me: sulphur for Venus, ammonia for Jupiter and raspberry schnapps for an intergalactic gas cloud. From disgust for Venus and Jupiter to delight for the intergalactic gas cloud, all the feelings were there. On Friday, the big final event with the parents took place. In the morning, the kids, Sophie and I built even more rockets, some of which were chosen to be launched in front of the parents. We also marvelled at the huge rockets some of the children had built at home with their parents over the course of the week; the families must have drunk a lot of lemonade and sparkling water to provide all the bottles! In the afternoon, it was finally show-time. The final rehearsal was done, the buffet was ready and the choreographies were studied, and then, the parents arrived. After some cool dances and comic-readings, Sophie introduced the Austrian Space Forum and both of us talked a bit about the past week and interviewed one kid each. After the distribution of the certificates, the rockets were ready to be launched. Amid applause and laughter, the masterpieces flew high. As a fiery final, our solid fuel rocket was shot into the sky. At the buffet, we spoke to many interested parents and children. We received a lot of positive feedback and would like to thank General Electric and Klangspuren for having us and giving us this opportunity to inspire. Who knows, maybe in a few years, we’ll meet one of the kids at our Suitlab!